Celebrating Fury Basketball’s Success in winning 8K! Fury Basketball Club were successful in obtaining an $8,000 grant from Holden Australia, as part of the Holden Home Ground Advantage Grant – which they found through the Sports Community Volunteer Newsletter. Fury Basketball Club is a grassroots club that plays in the local summer domestic basketball competition in Mandurah, WA. They are the largest of eight local clubs with 515 members aged from 5-years old up to adults. The club’s aim was to get more kids from all backgrounds and abilities playing basketball. Out of this, they created their “You’re Welcome” program. This was the basis for their application to the Holden Home Ground Advantage Grant program. Therefore, Fury Basketball Club focus on sponsorship and grants for income. Fury found the Holden Home Ground Advantage Grant via the Volunteer Newsletter back in March 2018. They were notified in July of their successful application. It was a welcome find as it provided the opportunity to secure funding to run the “You’re Welcome” program. The grant money received will also help the club pay for wheelchairs. Fury will be able to support the introduction of a local wheelchair basketball competition in February next year. As well as purchasing balls for the youngest members who are new to the club. This makse sure they have one to bring to training and to practice with when they’re at home. Some of the grant funds will also pay for coaching courses and coaching boards. The club has many junior coaches that they mentor, and lots of parents new to coaching that often volunteer their time to help out. “Without them we wouldn’t have a club at all,” says Wendy and added. “We have also purchased a lot of signage through the grant to attract people along to the “You’re Welcome” Program that will run later this month, kicking off with a ‘Come and try day’”. 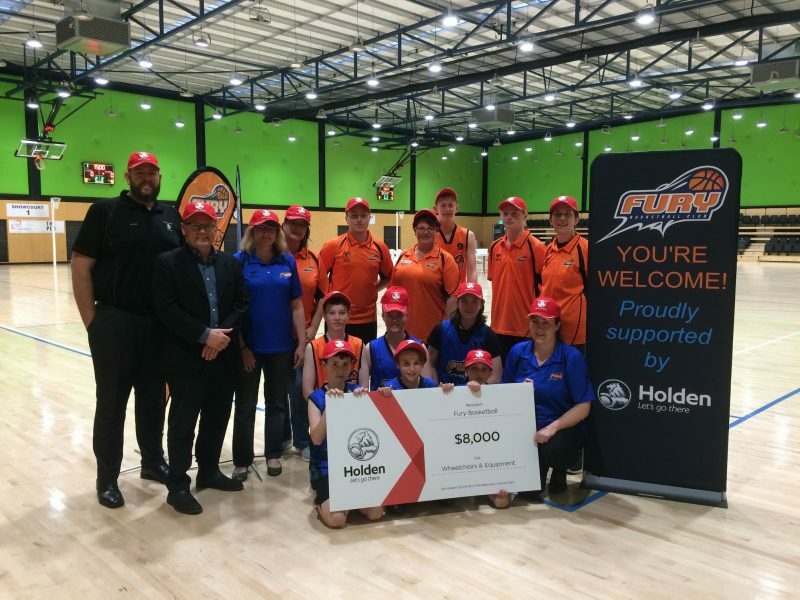 A win not only for Holden as a supporter of grassroots sport, but for Fury Basketball Club and the wider community that are stakeholders in the club. Wendy and the team at Fury also use other resources from Sports Community including the membership platform Club Spot. The subscription to Club Spot was provided by the City of Mandurah and it gives club volunteers from all clubs in the shire free access to some amazing tools, videos and templates. “We have copied the committee role position descriptions from Club Spot. We are currently editing them to suit our Fury committee positions,” says Wendy. It’s very clear that nowadays there are some great support for grassroots clubs and their volunteers, and the best way to keep on top of these opportunities is to visit Sports Community and sign up for their newsletter.